Kate and I attended TimeGate about a week and a half ago, where I got to debut my finished 10th Doctor suit, and I was on four different panels! We met lots of other cosplayers, which is always fun! Right off the bat, while waiting in line for our tickets, I met this lad, who had a spoon he insisted needed to be more sonic. 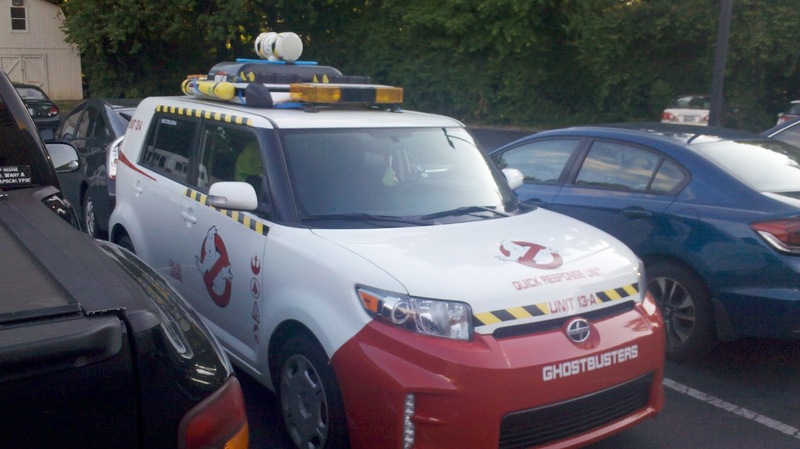 I met a Lady 11, which was cool. I met these handsome fellows while riding in the elevator. There was a Nu-Who costuming panel, which naturally attracted lots of cosplayers. I met this lovely couple, obviously cosplaying "The Idiot's Lantern" - and I have to give this guy props for his costume! From the natural-white shoes to the ThinkGeek sonic screwdriver, from the replica tie to the hair, he did it right! I got to see my first "real-life" R2-D2, which was exciting! It was truly a splendid experience. 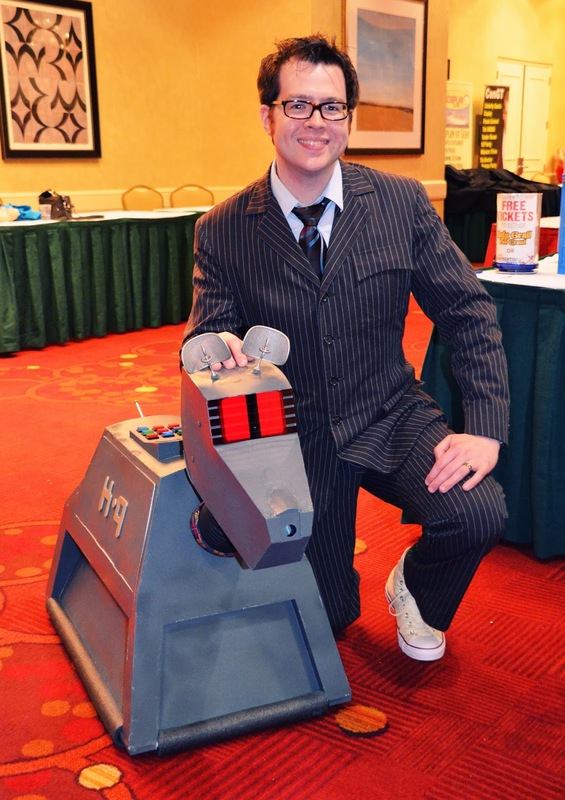 Dogs are truly a man's (or Time Lord's) best friend. One of the amusing stories he told was how it was actually during the filming of The Five(ish) Doctors Reboot that he got the call about returning in "The Night of the Doctor" - talk about irony! Later that afternoon, I was one of several panelists on a Star Trek 50th anniversary panel, which was fun. 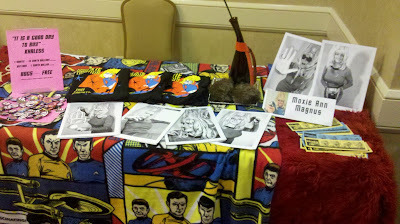 There was a nice turnout and we talked about all things Trek. I saw this awesome car out in the parking lot, and I'll let you guess what music it was playing! 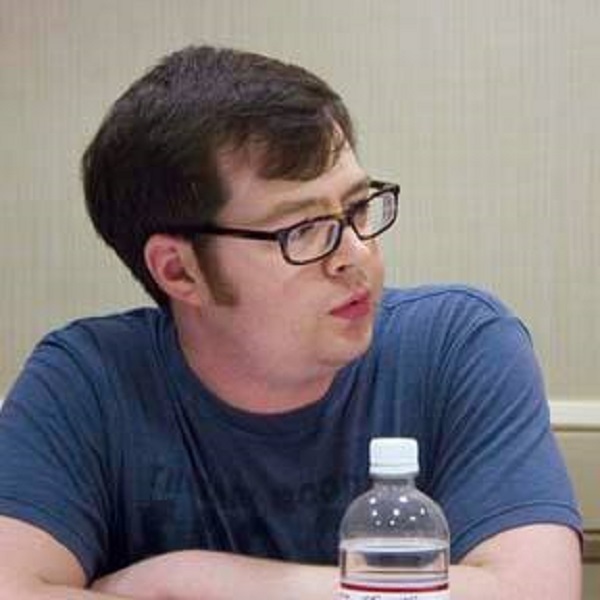 I was on another panel that night, a 10-year retrospective look at season ("series") 2 of Doctor Who. It was late that night and not many people showed up, but it was a fun panel nevertheless. I shared the panel with Bill Wilson of the Coal Hill Teacher's Lounge podcast, who recorded it all, so hopefully you'll be able to listen to it soon. Sunday was my big day! Immediately following my panel was another panel on general Nu-Who costuming, which I shared with several other panelists, including one seriously badass U.N.I.T. soldier. 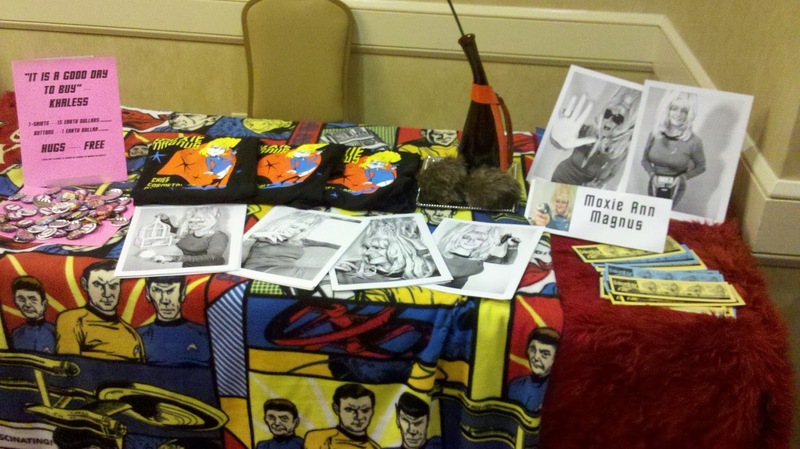 I met Moxie Ann Magnus, and she was a hoot! Sunday afternoon, I attended another Paul McGann Q&A (and got a good seat this time!). When it came time for audience questions, I was first in line! I noted that the (Eighth) Doctor's costume was different in "The Night of the Doctor" than it was in the TV movie (duh) and asked how much creative input he had in the new costume, how much of it was others', and generally how the decisions were made. He said that his involvement with the whole project was quite short - only a day of filming, and he was on his way! He basically showed up and the costume was ready for him, and ready for filming. He also said that he preferred that costume to the TV movie costume, because it felt more like actual clothes a person might wear, and because many of the individual components of the costume were military garments from throughout history and it felt like something one could wear into battle. And finally, he jokingly pointed out that he was very glad there wasn't a wig waiting for him this time. As my favorite (half) Vulcan would say, "Fascinating ..."
Immediately after the Paul McGann Q&A was my friend Michael Cowart's panel on the Eighth Doctor's costumes. It was a wonderful presentation. Michael's a brilliant man and an Eighth Doctor guru; he has literally spent years researching and perfecting his Eighth Doctor costume project(s)! He's also the guy who first inspired me to take my sewing skills to the next level and encouraged me to learn about tailoring, and it's always a treat to get to see him. 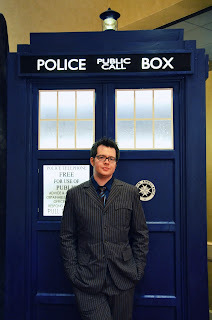 At the con was this absolutely fantastic TARDIS, provided by Christopher Marney, Mad Man with a Workshop, and Kate grabbed some photos of me in my 10 suit. 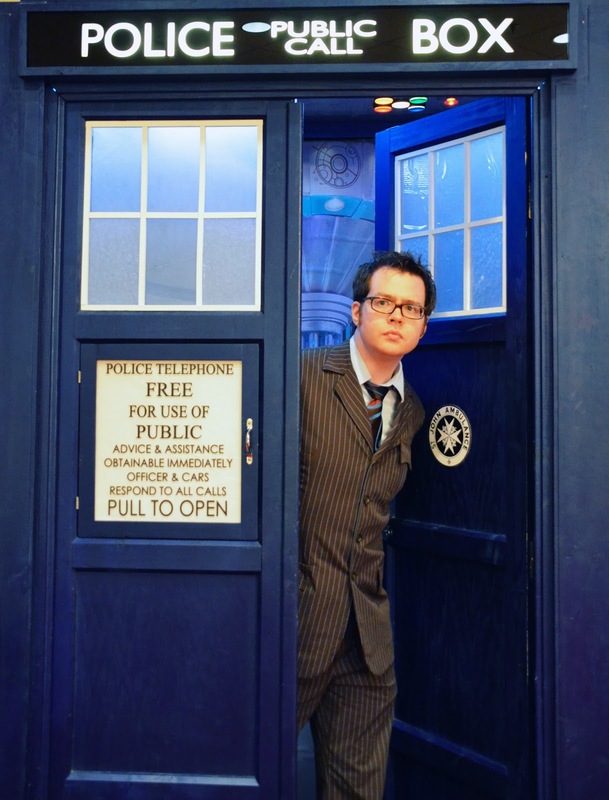 I must say, too, that standing in the doorway of a fully lit, thrumming, throbbing TARDIS dressed as the Doctor is a thrilling, uplifting experience. Just standing there, relaxing, and letting my imagination run wild was one of the highlights of the trip for me! 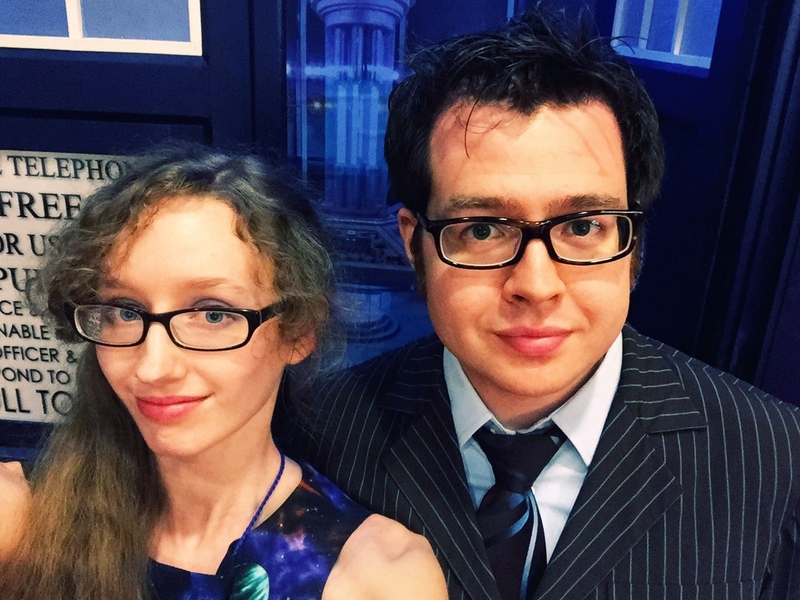 Naturally, my lovely lady and I got a couple pictures together with the TARDIS, too. 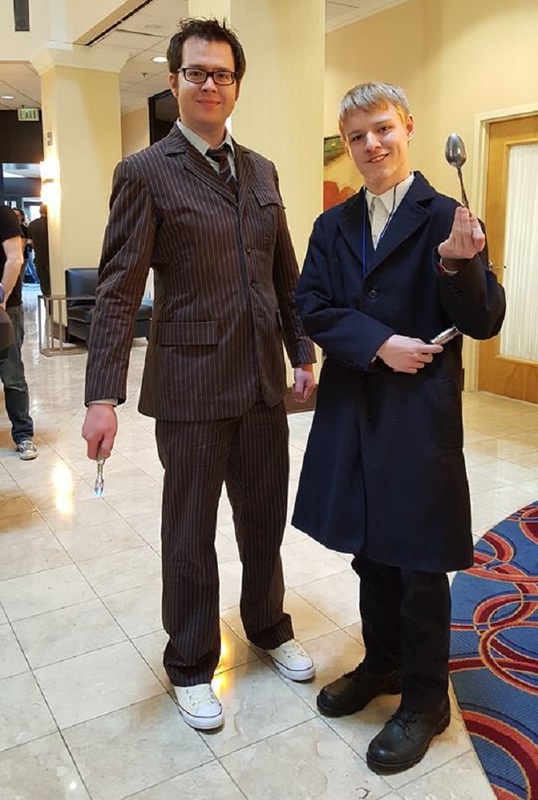 Although many of the con attendees were teens and young adults, I was surprised to find that most of the costumes and cosplayers seemed to be from classic Who - a welcome surprise, sure, but a surprise nevertheless! It's nice to know that classic Who is still enjoyed by today's youth who want to express their enthusiasm and fandom. Naturally, there were cosplays for nearly every Doctor, although the First, Fifth, and Ninth seemed to be the least popular at this event, and I only saw a couple Second and Sixth Doctors. I saw a handful of Fourth Doctors, some of them fantastic. There were a few other Tenth Doctors in addition to myself, but the most popular cosplays appeared to be the Seventh, Eleventh, and Twelfth Doctors. 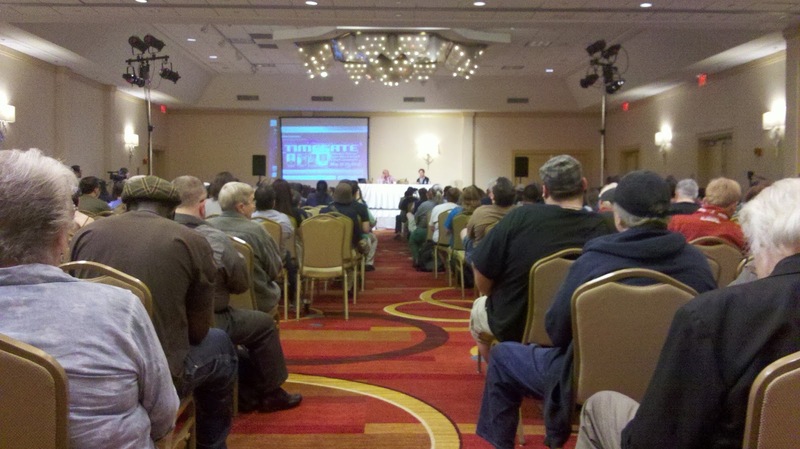 Overall it was a fun weekend, both as a panelist and as an attendee! 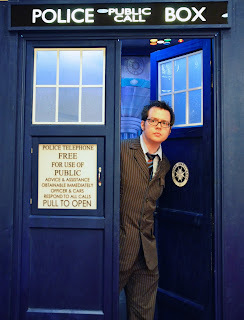 10th Doctor brown suit - finished photos!